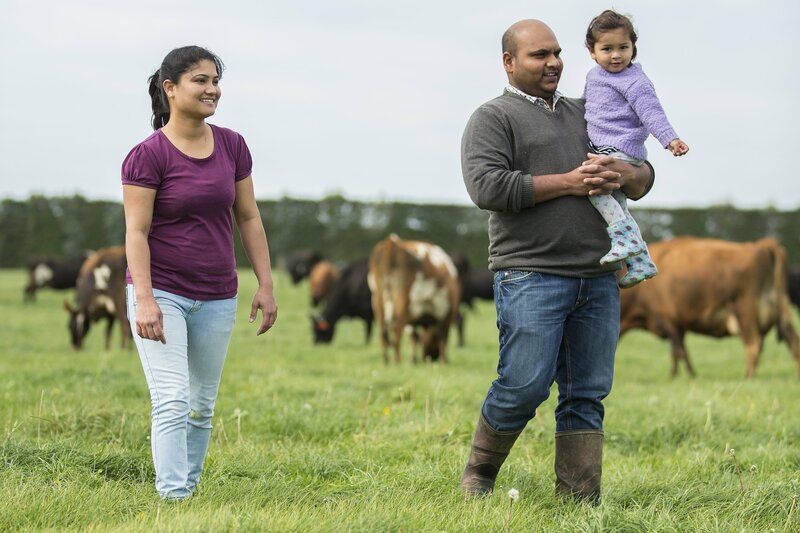 A passion for animal welfare, combined with attention to detail and clear systems, has seen Mid Canterbury farmer Sameer Nimbalkar make dramatic improvements to the health of his herd. Find out how simple changes can make all the difference. It’s clear watching Sameer interact with his pet cow Saguna that he has a strong affinity for animals. “She was the last calf born in the 2015 season and the bobby truck had already been, so we decided to keep her,” he says. Her name, of Indian origin, translates to ‘all good qualities’, and while she suits her name now, it wasn’t always the case. “She was small and timid. Now, she’s bigger than some of the cows in the herd. She’s proof good care pays off,” says Sameer, giving her a scratch behind the ear. Sameer has always had a passion for animal welfare and trained as a vet in Mumbai, India, where he grew up. But it was a fascination with New Zealand’s pasture-based approach to dairy, along with its world-leading animal welfare reputation, that saw him and his wife Radha, who is also a vet, move halfway across the world in 2010. Sameer has spent the past seven years working for Tom Mason on an 830-cow farm in Rakaia owned by Terracostosa Ltd. This season Sameer is taking on a variable order sharemilking position on a 600-cow farm in Oamaru. When he became farm manager in 2015 he identified three key areas he wanted to improve: mastitis/somatic cell count (SCC), down cows and lameness. Sameer and Radha came up with a strategy to target mastitis first because that was the farm’s biggest problem at the time. The pair take a proactive rather than reactive approach to animal care. When it comes to managing mastitis, they use antibiotics only to treat cows that display signs of the disease. This approach helps them to avoid antibiotic resistance in the herd, says Sameer. “At the beginning we had 130 three-quarter cows with a high SCC or infected quarters. We managed to get this down to 20-25 by December that season. We never culled any infected cows,” says Sameer. “The SCC went down from 200 to 120-125 in the next season. That season the farm won an award from Synlait for Most Improved Milk Quality. For the last two years it’s been in the 120 range. “We believe in preventing the disease through good management and practice, rather than having to cure it,” he says. Sameer and Radha then turned their attention to reducing the number of down cows each season. In the 2015/2016 calving season they had about 100 down cows with milk fever, or roughly five a day. This season, they’ve had only about 20 (none from the milking herd). Sameer took a simple approach to tackling the issue: pen and paper. He and his staff began recording every cow that went down. They noted the day, time, body condition score (BCS) and weather conditions to see if any trends appeared. “We monitored body condition scores closely because if the cows are too fat or too skinny they’re more susceptible,” says Sameer. “We also soil tested the paddocks to check which minerals were deficient. “Next, we made sure the cows were getting the required minerals – such as phosphorus, magnesium and calcium – in their feed. I focused on training my staff to make sure they were mixing the minerals properly to ensure every cow gets the right amount every day. Sameer strongly recommends record-keeping when it comes to any issues around animal care, and says this practice has helped him make dramatic improvements to his herd health. He found record-keeping particularly useful for managing SCC and down cows. His staff also carry a notebook to jot down any observations throughout the day. “Having good records is extremely important; it provides a lot of valuable information. I like to think of it as research,” he says. In the 2015 season, the farm also had a number of lame cows. Determined to come up with a strategy, Sameer researched the DairyNZ website and came across the Healthy Hoof Programme. He used this as a foundation for his plan, which involved training staff to identify a sick hoof. Sameer says he also regularly reminds his staff not to push cows when they’re walking on the race, or push the backing gate to rush cows into milking shed, which could cause injury. “It’s often the small things that make all the difference,” says Sameer. When it comes to caring for his cows, Sameer takes no shortcuts. He’s in the milking shed most mornings and afternoons to check the cows, and if he can’t, he delegates to his second-in-command Chin Gurung. Given Sameer’s vet background, he seldom calls a vet. Sameer, Radha and the team have also seen fantastic calf-rearing results this season – they haven’t lost a single replacement calf. “This season we aimed to rear 200 replacements and ended up with 244,” says Sameer. He credits this success to collecting the calves three times a day, ensuring they’re fed within six hours of being born, warming the milk prior to feeding, and regularly cleaning and disinfecting the calf sheds and feeding equipment. His staff also carry out extra checks in bad weather to ensure calves aren’t left in very wet or windy conditions for an extended period. In 2015 Sameer and Radha developed a comprehensive calf rearing guide to train their staff. Their boss Tom Mason was so impressed with the guide that he rolled it out across the other four arms he oversees for Terracostosa Ltd.
“It’s a really comprehensive guide, full of helpful information,” says Tom. The calf rearing guide was also praised by Dairy Industry Award (DIA) judges in March, who recommended it be published and distributed to all farms in New Zealand. In March this year, Sameer won the New Zealand Dairy Industry Awards (NZDIA) DeLaval Livestock Management Award for his outstanding animal care. But Sameer is modest about the achievement, saying many other farmers are doing a great job caring for their cows.